Not sure where Matthew sits in this guy’s Bible! P&R’s Explorations in Biblical Theology series has been fittingly compared to IVP’s New Studies in Biblical Theology series, with the important difference being the former’s accessibility for wider audiences. In A Theology of Matthew at least, the writing is clear and easy to grasp, insider language (academese) and footnotes are kept to a minimum, and application is littered throughout. After two chapters introducing Matthew’s Gospel and its theology, further chapters introduce a theme, summarize it throughout the Gospel, and then reflect on its implications. Using the New Moses theme as an example, the third chapter consists of how Matthew presents Jesus as a New Moses, while the next chapter unpacks the comparison’s significance. Matthew intentionally presents Jesus in a way that identifies Him with Moses, Israel’s greatest redeemer. There are prominent linguistic and conceptual signs that Matthew presents Jesus’ infancy, teaching ministry, fasting, miracles, and transfiguration to recall similar events in Moses’ life. At this point Quarles is quick to specify that “these similarities are highlighted by Matthew but not invented by him” (p44). 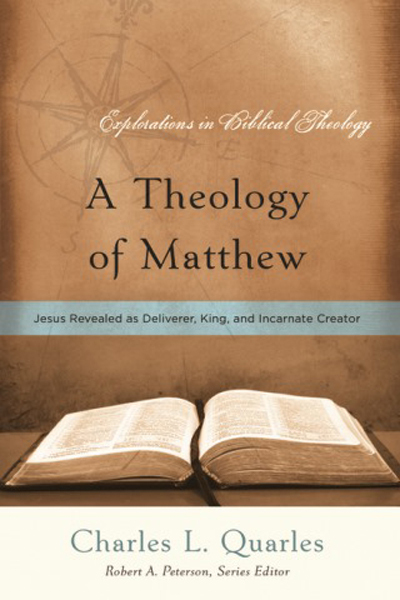 Matthew is both historical and theological. The implications of these similarities are then unpacked: just as Moses, Jesus was a redeemer and lawgiver. Quarles takes the opportunity to explain Christ’s work of salvation as a new exodus, His status as the Suffering Servant, the superiority of the New Covenant given by Christ, and also the necessity of repentance. Quarles uses this same approach with the other four themes. I thoroughly enjoyed this approach because it creatively demonstrates Jesus’ centrality and the relationship between the OT and the NT. Too many opinions about Christ are unhooked from any Old Testament foundation, but Quarles rightly shows how the OT both prophesies and foreshadows Jesus. This theme approach also emphasizes the covenants and allows Quarles to present Jesus as the fulfillment of God’s covenants with Moses/Israel, David, and Abraham. However, I was surprised that Quarles didn’t clearly connect the Noahic covenant (or even the Adamic, if Quarles accepts it) with his final theme of New Creator. With each theme, Quarles manages to comprehensively draw in a large amount of data from the Gospel and still make it understandable. He supports his statements with strong textual evidence and his overall thesis is convincing and excellent, but unfortunately there are a few undermining anomalies. First, in Quarles’ chapter on the titles of Jesus, he rightly points out the two levels on which they work: a more generic meaning, but also a “deeper” divine potential (e.g. Lord and Son of God), however I think he goes a little too far at points. As an example, he points out that Lord (kyrios) is the Greek translation of God’s name (Yahweh) in the OT, and thus this fuller meaning of the word is often in play when used of Jesus. I absolutely agree, but when Quarles goes on to list the uses of Lord in the Gospel, it is unclear whether he thinks each character intends this divine meaning, or just that Matthew is drawing his readers’ attention to the irony in their words. Yes, the Canaanite woman’s cry of “Lord, help me” (Matt 15:25) is reminiscent of Ps 109:26, but did she know what she was implying about Jesus, or is it an ironic “coincidence” that Matthew highlights? The distinction is important as it is hard to believe that random people were aware of Jesus’ deity during His ministry! The evidence certainly points in the opposite direction; even His closest followers appear ignorant to His true identity at first. 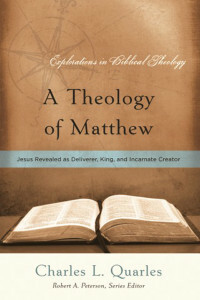 Perhaps Quarles simply thinks Matthew is the one underlining the ironic connections in hindsight, but quotes such as “confession of Jesus’ identity as Yahweh is a condition for becoming Jesus’ disciple” (p143) on the basis of Matt 7:21 makes me uncomfortable since that would require the same of His followers in His earthly ministry. Second, Quarles’ discussion of Jesus as the New Abraham was troubling at times. One need not be a dispensationalist to be concerned by statements that appear to unequivocally reject any future for Israel. First, Quarles doesn’t explain what it means that Jesus is the founder of “a new Israel” (p101). Since “new” can refer to either the renewal of something preexisting, or the beginning of something’s existence, the word is vague and can lead to misunderstanding. I am uncomfortable with Quarles’ statements such as “God has removed his favor from Israel” (p101), “the kingdom of God [has been] taken away from Israel” (p103), “the destruction of the temple would signal God’s abandonment of Israel for abandoning him” (p105), “God has revoked his invitation to national Israel to participate in the messianic feast” (p107), “the nation of Israel forfeited its privileges as the chosen people of God” (p129) and that Jesus has “transferr[ed] to [his disciples] the promises made to the chosen people of the Old Testament” (p110). Now, for me, this is simply overpowering rhetoric that sounds like having one speaker up too loud, or perhaps the other switched off entirely. Quarles rightly points out the seriousness of Israel’s rejection of Jesus and their need to believe in Him to be saved, but much of his chapter appears inconsistent with Paul’s more nuanced view in Romans 9-11. Admittedly, those are difficult chapters, but at the very least the church is “in-grafted”, whereas Quarles seems to tear down the whole tree and start afresh. Wouldn’t such a view have God’s word failing (Rom 9:5-6), due to Him rejecting His people (Rom 11:1), and leave the church wondering what keeps the same from happening to us? However one understands the promise of salvation for “all Israel” (Rom 11:26), surely the church’s relationship to Israel is more nuanced than this. If Quarles had simply spoken of the church as a “renewed” Israel or “grafted” into Israel there would not be such tension with the rest of scripture. Assuming the best, this is uncareful language. Though I would qualify my recommendation of A Theology of Matthew on these two points, I thoroughly enjoyed it and certainly recommend it as an excellent, accessible, devotional, rich and creative survey of Matthew’s Gospel that pays attention to the Old Testament foundation and exalts Christ throughout! This book was generously provided from P&R as a review copy, but that did not interfere with my review.